I'm a long-time Treo 650 user (June 05 is ancient history in cell phone years). The single thing that would boost this device exponentially is more RAM. More room to run applications could make all the difference. There are many great applications including games for the Treo 650. Eager beavers find very quickly, though, that they run out of room and right about then instability sets in. Great Apps Need RAM. I was surprised how little useable RAM was available on my 650. After a fairly long period of experimentation, I backed way off on some of the cool applications I purchased. There are a ton of top-notch applications for contact management (Agendus), chat (VeriChat) , launching apps (ZLauncher), managing your Treo (Resco Explorer), instant capture (Slap), quick visual reminders (BugMe! ), and a lot more. But they won't all fit at once in RAM. No problem, you say, just put them on the SD card. That's what I thought, but keeping extra apps on an SD card is more of an art than a science. I'm Betting that Treo Popularity will Surge. The Treo 680 with 3x the RAM solves the one remaining problem with the Treo. Treo 650's have sold really well, but just as sales are slowing, the 680 comes in lean and mean to most likely triple its sales. Cool Colors. Besides working great, the 680 comes in 4 colors! I'll take a red one. Skillful Refinement. The 680 is by no means revolutionary. It is all about small changes. Inching towards smartphone nirvana. It is thinner (-12%) and lighter (-12%) than its 650 brethren. Every little bit helps. Sans protruding antenna bump, it's a lot easier fit in a jeans pocket. Better software bundle. As usual, the free applications are better than ever. The uber-econo-smartphone. Priced to sell. But not so economical as to lose one bit of cool. In fact, it looks and works better than the 650. What is there not to like? Power-users Beware. The one thing that might stop me, is that it is not a 3G phone. EDGE is the fastest speed on the dial. If only I could get a Treo this slick and colorful and elegant at 3G speeds. But this is truly the sweet spot. The best value and maybe the best smartphone right now. Can a smartphone be a runaway hit? Or is it too geeky for the masses? Palm wanted to find out just how good their ideas really were. Finally, geeks might say that Palm isn't high-tech enough anymore. They haven't released a new operating system in a long time. I can't wait to see what Palm comes up with when they do release a new OS. Meantime, the Windows Mobile crowd beats Palm OS on specs and features. Yet as far as I can tell, they lag in ease of use. Most people don't have the time or inclination to master a hugely functional yet cumbersome device. Count me in that group. I think Palm OS delivers more useable power than its competition. Update Feb 19, 2007: I got a Blackberry Pearl instead of the 680 because of the vast difference in size. Thought I would go small and see if I can grok the Blackberry menu system. It is something to find out. Here's the link to my first post on the BB Pearl. No additional noise, stimulation from it. Satisfying writing experience. Analog - texture of paper, feel of pen when writing letters or drawing. Much quicker startup and shutdown for quick notes. More flexible than any software can allow. Permanent. Unless written in pencil and still pretty durable. Can easily write at all angles. Best free-form drawing for simple stuff that doesn't have to look precise. Great capture device that way and also great for a quick sketch of something to show what you mean while talking with someone. Improves your handwriting if you try. Improves your drawing and sketching if you try. Cheap in relatively small quantities which is what most people use. Not intimidating - or at least not compared to PDA. Pocket in the back comes in handy. Low maintenance. No batteries or outlet required! A portable computer that is comfortable in your hand. Stimulating, may cause eye fatigue compared to paper. Digital means content can be transferred and repurposed without re-entry Can bring along a lot of reference material - but it is typically a bit of a hassle to get that stuff on there from your computer. Knowing what to bring and refreshing the content is an issue. Can surf for information with things like Wikipedia, Web, RSS reader Handwriting recognition not so great. Not as fast or comfortable to record information. Delicate due to electrical nature - be careful about spilling on this or dropping it. Extra functions like voice recording and camera are nice. High maintenance, needs regular charging. I carry both. My Treo is my cell phone, so I almost always need it with me. Sometimes I wish I had a small cell phone that was just good at being a phone, though. I think if I were a heavy phone user, I might use something that excelled as a phone. No QWERTY, no small numbers. I've yet to master using other functions while I'm on the phone because I don't want to interrupt the call. That's too bad. Mobile Moleskines. Most of the time when I leave my home/office I have a large moleskine if I'm driving or a pocket moleskine if I'm on foot. If I am just walking in a loop and have no plans to go anywhere else, I bring my black Volant pocket Moleskine which is more comfortable in my pocket. I'm not expecting to write much and only occasionally do. Sometimes I limit myself to an index card for those loops. Depends on how long the loop is and what's handy that minute. Treo. The Treo QWERTY is very nice in the occasional situation where I need to type out an email of any significant length and that happens at times. I like to check my email when I'm out because I randomly get big ticket software orders which I like to fulfill ASAP. For all its fantastic modern swiss army knife features, my Treo doesn't inspire me to write. Although, there's one case that isn't true -- my web connection might provide me with stimulus to write. But just sitting there, it is inspiration neutral. If I need to record something and it is just a snippet, I type it in. I use it for: calling of course, looking up and recording phone numbers, writing down references such as books or movies I want to check out, reading the occasional ebook, reading RSS feeds, looking things up on Wikipedia or googling including using google maps to see where I am or to find something when I'm on the move. Lots of good stuff. My Moleskines. Here's where a lot of my current writing is. It's an excellent, enjoyable tool for writing ideas and notes and drawings. And sketching if I were so inclined. Space and pockets are in short supply, so we tend to want to address multiple needs with the same tool, but if I had my way, I would just write in my moleskine. I would write about projects perhaps and write reminders, but I wouldn't convert my special writing object into a to do list or GTD machine. But, that's just me. The Future. I'm hoping I won't have to choose. The Treo and its offspring will only get better. I guess when a PDA/Communicator starts feeling and looking like paper, the death knell of the moleskine and its offspring will sound. But meanwhile, I'll hunt for pocket space and enjoy the luxury of having both. Yesterday I posted a quick set of thoughts about the rumored Treo 670 that showed up on Howard Forums and then Engadget last Thursday and Friday at Treo Addicts. The Verizon-branded Treo 670 is shown running Windows Mobile 5 and is said to run EVDO and sport a 1.3 mpx camera. It still may be a hoax but, if it is, it is a really convincing hoax with high rez photos and low rez videos to prove the point. Today I made my first post for Treo Addicts! I was invited to write for their group blog and said yes. I'm really excited about this new undertaking. As you probably know, I've been a Treo enthusiast since buying my Treo 650 in early June. 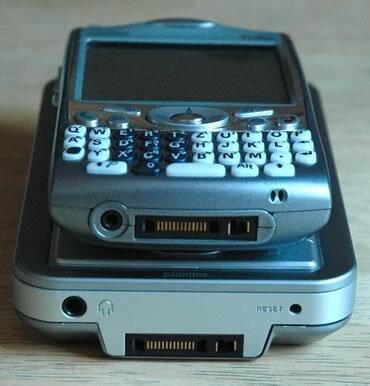 From now on, most of my Treo posts will be on the Treo Addicts site. I'll write a small post here to let you know when I've written new posts there. If you are interested, check out my post about Treo 650 Memory Woes and Wins. Here you go. This is a rather low quality photo of my Treo 650 screen. I am playing Om Malik's first pod cast. Cool, huh? I bought AeroPlayer yesterday with AAC and MP3 capability. You can download a lot of free skins, one of which was this one! One major advantage to listening to podcasts or audio books on a Treo is that you have a built-in speaker. I can set the Treo down and listen to it or play it for myself and anyone else in my vicinity. This is a major convenience. Besides not being able to do an iTunes-driven sync, you can't playback iTunes store AAC music. This is exactly the music I most want to play. There is a way to remove the iTunes DRM using a 3rd-party app which I haven't yet tried but probably will -- knowing me. AeroPlayer has more info if you want it. In the mean time, yesterday I burned 17 of my favorite iTunes-DRM songs to a CD. Then I imported them back into iTunes as AAC 256. Then I dragged those songs to my Treo SD card and they played fine. Since I don't have a 2.5mm to 3.5mm adapter, I can't listen to these songs with a high-quality headset but, I have one on order so I can check that out. Truth is, I'll be listening with my phone/music headset that's on order, so the signal degradation of going from DRM-AAC to CD and then AAC probably won't matter for my purposes. I knew this, so I didn't spend a lot of time looking for a way to rid my songs of their DRM. I have mixed feelings about doing that and this method still works for my purposes. Couldn't resist showing you how close one can get to running iTunes on a Treo 650. Another main source podcast which is only going to tangentially inform on Treo 650, is the Engadget podcast. Peter Rojas is a Treo 650 owner. I just listened to the June 21 cast and it has a nice little chunk on the Treo 650. These guys are in a position to talk about things I want to know. So, put them on your list to try out. They are listed in iTunes. Then, there's the reason I wrote this post. Something you probably have not found on your own: The Palmloyal podcast. So far, Carl Brooks has only done 2 of them since he started in mid-June. I'm hoping there will be many more. These are not fancy or even very entertaining. What makes them great for me, at least, is that they cover key pieces of information that I wanted to know. Very information/experience-rich. I especially liked the second podcast which is 27 minutes long - not too much of a time sink. The best parts are (1) Using your own custom ROM. By rolling your own, you can delete out some of the standard Palm stuff that you've replaced with better third party versions. That's what Carl does and he tells you what he's got on there. This means you don't have to (a) use up RAM with your replacements or (b) put your replacements on your SD card which slows them down. Shadowmite's Treo Tricks, Hacks and Patches is a site not to be missed if you want or need to maximize your Treo and you are willing to venture into more geeky stuff. (2) What's on my Palm?. Which tells you 5 pieces of third-party software that Carl Brook's has on his Treo 650 and what he likes about them. There's lots more to tell, so I'll be pumping out more Treo posts in the near future. Just a couple more things as I continue to research the Treo 650. One, I found a fun little simulation called Village Sim. It runs 24/7 whether or not your machine is on. Make sure to run the tutorial - it's one of those that gets you started in a real game with advice as you go along. This is very well done. I haven't played a game like this even though I have played Sim City, Civilization and Warcraft and they have some slight resemblance. I found it via my other rediscovery of Pocket Goddess. She reviewed Village Sim and on that basis alone, I bought the game. My only Treo game at the moment. I'm usually too busy blogging and surfing and what not - which I enjoy a lot - to play games, but Pocket Goddess lured me. Then somehow, I found myself over at Pocket Goddess and noticed that she does quite a few features, interviews and reviews. I'm very impressed. This is encouraging. I'm back to ferreting out and reading good stuff about Palms and Treos at the moment. And, after an hour or so playing Village Sim (sometimes letting it play and sometimes intervening), my progress is so-so. I lost my best guy when he saw a face at the edge of the forest and I had the choice for him to investigate or back away. Investigation proved fatal! Other than that, I've managed to get one couple to have a baby. That was fun. One last little warning about Village Sim. If your eyesight isn't too good, you may have trouble. There's a lot of little stuff on the screen. I pulled out a magnifying glass to help me out and that actually worked well. Thick reading glasses might work too. Anyway, that's how the evening of Saturday, July 2nd is going. I just moved my big green leather recliner and ottoman into my home office along with a couple of bookcases. I decided that now that I'm mainly using my Powerbook, I don't need two desks in my office. So the desk is gone and I've kind of created a home library -- something I've always wanted. That's it for now. I'll be reporting further on the Treo soon. I was just getting my groove on with Odeo podcasts when iTunes 4.9 showed up and got me going with that. By building strong podcatching into iTunes, Apple cut out the middlemen. I'm glad Apple is putting their weight behind the podcasting phenomenon. They can call lots of shots on day 1 because they can offer any podcaster an enormous potential audience. The equivalent of foot traffic in retail. Podcasting is the latest thing in portable music players and iPods need a new thing to keep the mania going. The convenience of searching for, selecting and grabbing the podcasts you want from iTunes store and then synching with your iPod is going to trump the competition. What competition? So, right now, I'm using iTunes 4.9 on my Powerbook and synching that with both my aging, monochrome, 3rd gen 15 gig iPod and my 1 gig shuffle. I really want the color screen 60 gig just so I don't have to try to read that mono screen one more time. In sunlight, forget it. But now there's another player on the field that I'm playing around with. Yes, that would be my Treo 650 as listening station. Today, I ordered a Seidio 2 in 1 retractable earbuds headset for $34.95 from Treo Addicts -- my favorite Treo site. I like to buy from the sites that provide the best authenticity and information -- you know -- voting with my dollars. This little Seidio headset plugs directly into the 2.5 headphone jack and provides stereo with 2 buds plus a microphone and button that lets you hear when your phone rings and switch seamlessly to the phone and back to your favorite podcast/music when done with the call. Cool! So, this morning, here's what I did to prep for my morning exercise walk. I went to my Music folder and found the iTunes Music/Podcasts folder. I easily found the podcasts I wanted and dragged them into the AUDIO folder on the 1 gig SD card that I use with my Treo. I unmounted the SD card and put it back in my Treo. Then fired up RealAudio -- I haven't bought a 3rd party app yet -- and there were my podcasts ready to go. The sound was just fine over the single-bud headset that comes with the Treo. The nice thing here is I can see what I'm listening to and I can (1) bookmark if I want and (2) can drag the slider and skip over stuff I don't want to hear like a song or the standard intro spiel on IT Conversations which gets mind-numbingly old after a while. My favorite podcast at the moment, perhaps because I've been into mobility a lot lately, is Tinypodcast with Josh Bancroft. It's low key and low budget, but I like Josh's easy style and he is a smart gadget freak whose opinion I respect. I also listen to Engadget and Adam Curry when I'm in the mood. One more comment on the Treo. I'm finding a dearth of information about key Treo subjects like how to maximize its paltry 23 megs of useable RAM. I really don't want to do tons of homework to discover best practices. I've been grazing mostly on tiny tidbits, subscribing to Treo in NetNewsWire and Techorati. The signal to noise ratio is iffy. Just now, though, I found The Treo Knowledge Base, a wiki sort of FAQ over at mytreo.net, another site that I like. I've been looking for a good wiki with independent/community compilation of Treo information and I'm hoping this is it. Anyone can contribute and comment. They suggest you start on the intro page which I'm doing. From what I've read so far, though, it's better than nothing, but could be so much better. The last comment on memory management was "Best tip for users is: experiment :)." Just what I didn't want to hear. I already checked the Wikipedia Treo and Treo 650 entries which don't amount to much, but the external links were helpful. If this knowledge base thing doesn't pan out, I'm stuck with the Treo manual and two little books (The Treo Fan Book and Now You Know Treo) which have some good things here and there but not enough depth on key subjects like memory management. So far, it looks like I can run many apps on my SD card by just copying the apps over to the card with the Treo's copy command. Today while I was down at Peet's having a nice Friday afternoon coffee and reading my Treo books, a guy started asking me about my Treo. He had one too. It was fun sharing tips and tricks. I got him up and running with beaming. I couldn't resist adding this shot of a the Treo 650 on top of a Lifedrive when I found it over on Flickr. I know, I'm obsessed. But, you gotta admit they look good together!